The above throws and expos should be used as a starting point only and then adjust to suit your own style or feel. Before we begin you're going to need to have some decent measuring tools. One or two Robart incidence meters. The longer bar option for item 1. 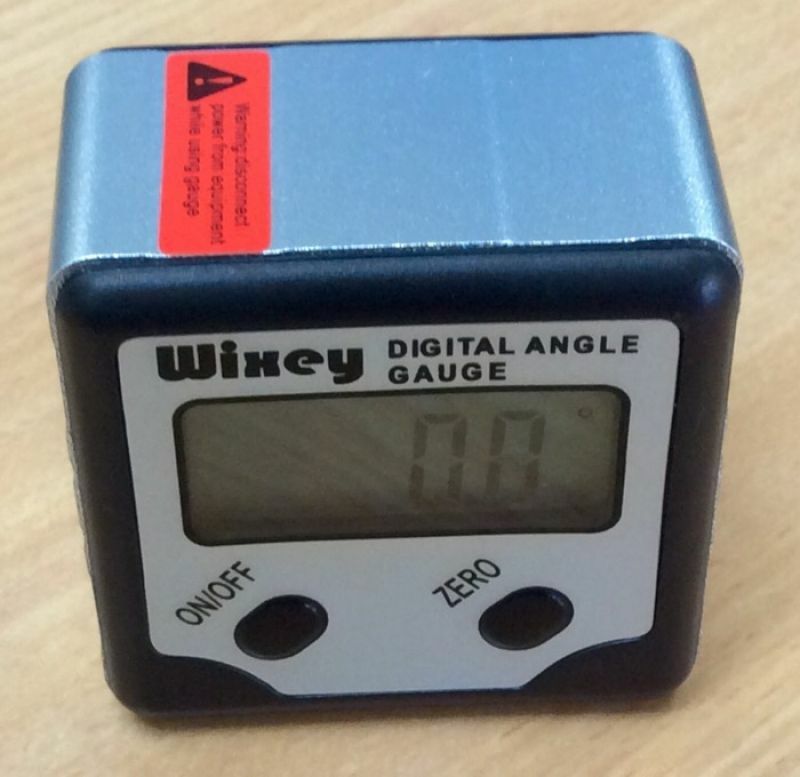 A Wixey angle meter WR300 or WR365. Available on eBay. 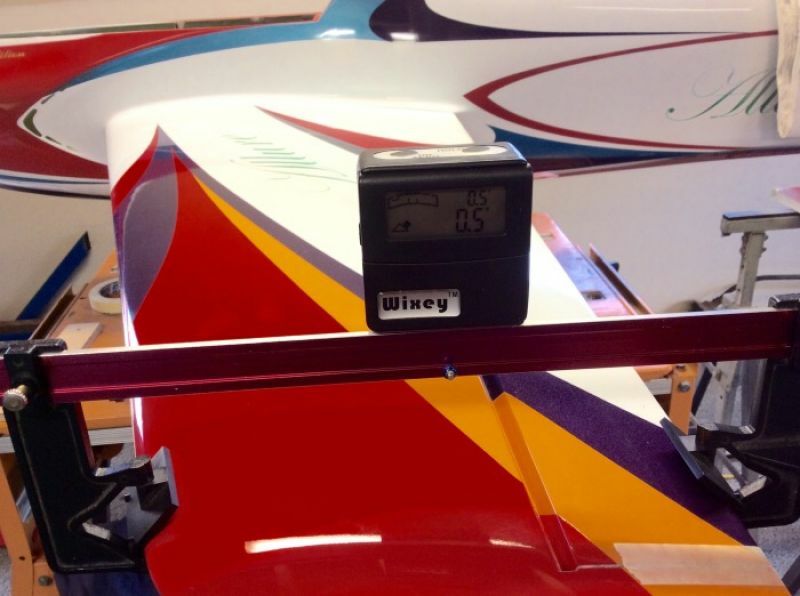 Note: The WR300 is 11 grams lighter than the WR365. A repeatable throw meter. I made my own. 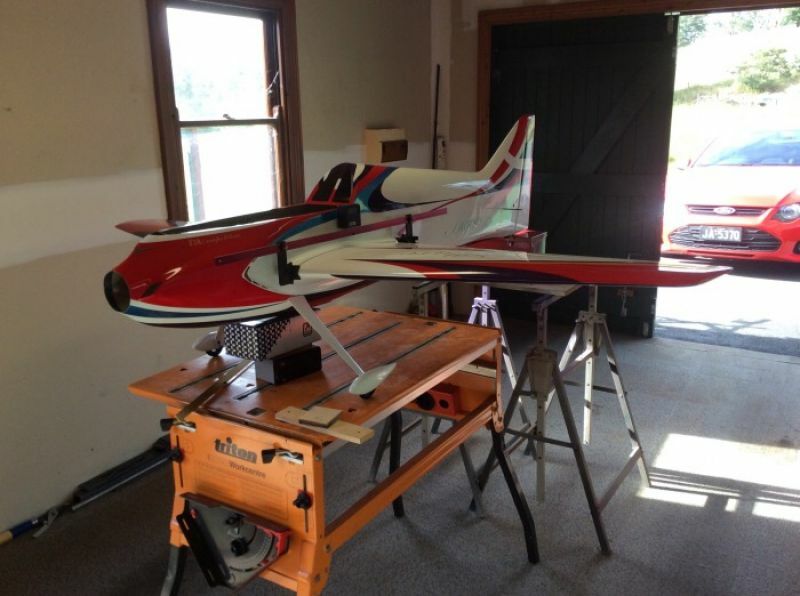 You will also need a stable table to support the fully assembled model. If the table moves your readings will also move. I have successfully supported sat the model on its main wheels and supported the underside of the fuse and stab. Just lately I have been measuring the model in a cradle. This is the best way I have found. 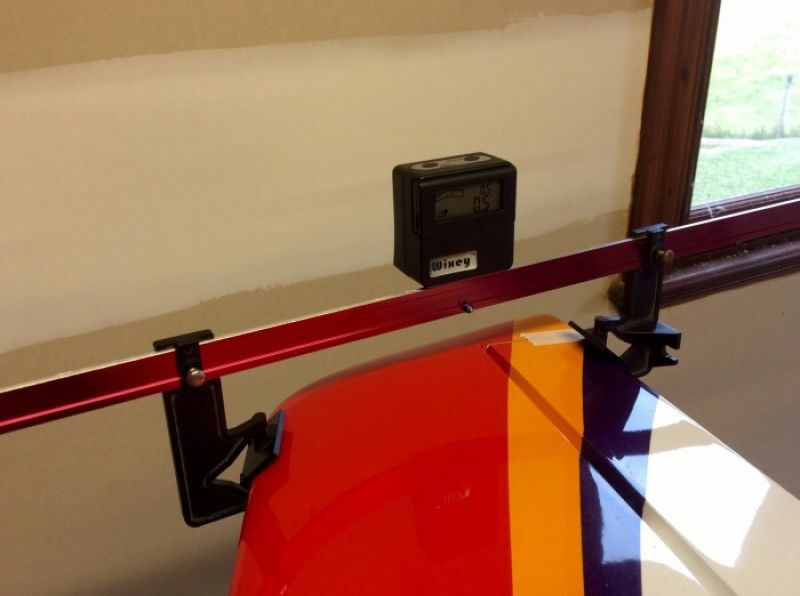 Modifications to tools - Firstly, ditch the analogue Robart incidence meter. We only want to use the bar/s and the plastic wing clamp parts. Cut the 36" bar about 8" shorter. 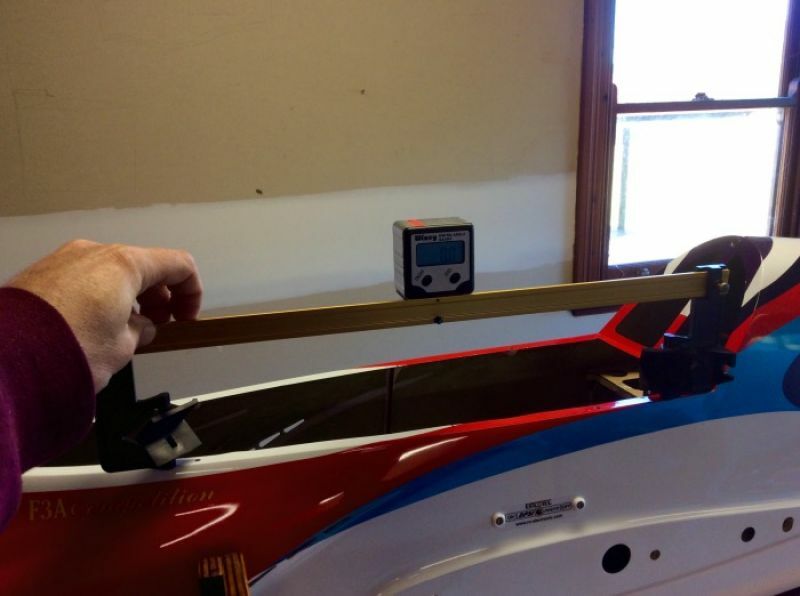 It only needs to be able to fit on the wing root and the extra length may get in the way of your cradle. Cutting it shorter also reduces its weight on the surface. Now, unless you have three hands, you're going to want to make some sort of bracket to hold the Wixey angle gauge to the bar/s. Conveniently, the Wixey has a magnetic base. This being the case, I made a small bracket out of thin wall steel tube which is simply screwed to the bar. See photos. This is all you need and it's very robust. The Wixey will stick to this bar like nothing else. This is important because we don't want that Wixey falling onto a wing or stab do we? The other important thing is to make the hole in the bracket a little bigger than needed for adjustment. We want the bottom surface of the Wixey to rest flush on the bar/s. Datum - As mentioned in the fuselage blog, the canopy base line is the datum. All measurements are to be referenced from this datum. I set this datum using the short Robart bar with the plastic wing clamps fully extended. Place your fuse in a suitable cradle on a stable table. Sit the bottom of the plastic wing clamps on the canopy base. I make sure one end is at the most aft section of the canopy base and that it sits halfway over the edge of the fuse. This way you have a hard surface to reference off. Now zero the Wixey. Datum done! Wings - This is the first item to be checked. You'll need to use the long bar for this measurement. Fit the wing tube to the fuse and then fit both wings and secure them with the supplied wing nuts. Now fit the incidence meter to the root of one of the wings. Take a reading off the Wixey and note it down. Repeat for the other wing root. If all is as it should be, both readings should be the same. The incidence on my Allure is set to +0.5 degrees. 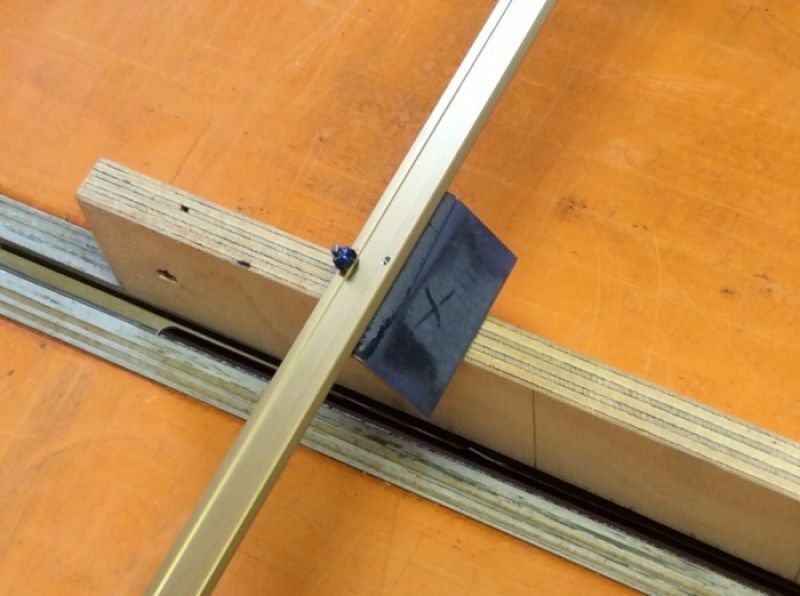 Whilst the incidence is not adjustable via the normal Gator type adjuster, you can make adjustments by elongating the anti rotation pin holes and gluing on new doughnuts. Alternatively, you could fit Gator style wing adjusters to the fuse. Feel free to make adjustments to the incidence as required during the triangulation trimming process. Stabs - The stab incidence is independently adjustable. This means both stab halves can be individually adjusted. Many "top name" airframes don't have this feature and suffer trim issues because of it. ;-) Ever wondered why your model pulled to the belly in one knife edge and pulled to the canopy in the opposite knife edge? Tape both elevator halves with masking tape to prevent them from moving. Now fit the incidence meter with small bar to the stab root. The stab adjusters have grub screws top and bottom for adjustment. A little bit of locktite on these grub screws doesn't go astray. With the wings at +0.5 degrees you want to have the stabs both at +0.1 degrees. Take care to get both stabs the same. Centre Of Gravity - You want to start with the CG set at 30% of MAC. At this setting the model has a very neutral feel.